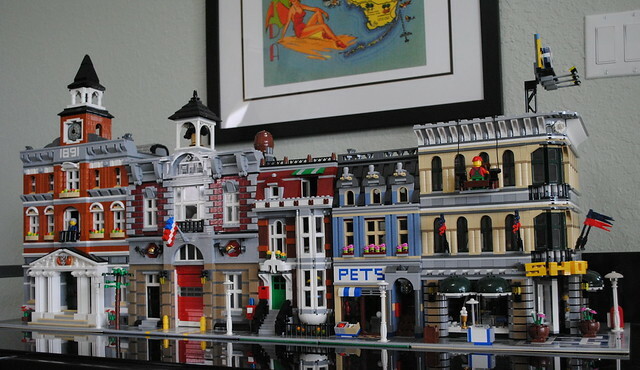 Eventually, you've built one of each Creator Modular Building in your collection, and you've decided that you can't stop until you've added the Green Grocer, Cafe Corner, and Market Street to your LEGO City scape. You head over to Youtube and watch a couple set reviews of the Green Grocer 10185, and decide you'll start there. Almost $1000 for a MISB set? $700 for a used copy? That's a lot of money to spend on a single LEGO set. Sure it will look awesome on display, but for $950, you could buy a brand new 75059 Sandcrawler + 75060 Slave I + 75095 TIE Fighter and a bonus 10236 Ewok Village. Are there any other options? You've heard other collectors talking about "Bricklinking" retired or Hard-to-Find sets before, but you're not sure what that means exactly, or how to get started. The term Bricklinking is AFOL slang, and refers to the practice of buying all the bricks required to build a set from individual brick vendors. is the original, largest, and most well-known marketplace for LEGO brick vendors, but it is not the only quality source for LEGO bricks. Other options include as well as LEGO's and online services. a cost-effective way to load up on bulk bricks. Selection is more limited, and rotates on a monthly basis (below). Bricklink Vendors (above) typically operate part-time, home-based stores. Part selection, availability, pricing, and shipping very significantly by vendor. There a few large-scale, full-time Bricklink vendors, but those are probably the exception, not the norm. To Bricklink, or not to Bricklink, that is the question. Once your account is established, you're ready to do some preliminary set research.The easiest way to get started is to enter the set # or set name in the search bar located at the top of screen. This takes you to the set's catalog entry which gives you basic information such as demographics, the number of parts & minifigures, and price guide data. There are links to the part inventory and catalog entries for the box and instructions. Clicking the Set Inventory tab or Item Consists of 2335 Parts link brings up the detailed inventory screen which displays each part image, quantity, part number, and description. Clicking an individual part number brings up its entry in the part catalog. For example, scroll down to the blue parts section and click the #6005 Brick, Arch 1x3x2 Curved Top. Here is the part catalog entry for #6005- Brick, Arch 1x3x2 Curved Top. Part catalog entries are great for getting a sense of current and past part values, available colors, and alternate/substitute parts for the same piece. In the top right, you'll see info depicting how many sets include that particular part. Clicking the Item Appears in 125 Sets link, brings up the list of all sets featuring part #6005. The list is grouped by color, and displays the quantity of part #6005 included with each set. Each set's year and image are shown, with a link to its inventory and catalog entry. This is a really useful feature that helps collectors determine if they already have an expensive or hard-to-find part in their collection. You have several options to select before calculating the part out value (shown in red above). After making your desired choices, click the Get Value button to view the results. By default, part-out values are calculated by adding the average sale price of the individual pieces. Actual cost to obtain all the parts for any given set can be significantly lower depending on the selected vendor and region. These values do not include shipping, handling or vendor fees, which may add substantial cost to the total. In some cases, instructions and/or boxes may only cost a few dollars. For highly desired or rare sets, these items may cost hundreds of dollars to acquire. It's often more cost effective to forego these items and download the digital instructions from the internet. If you're happy with the initial cost estimate, and don't want to alter the stock inventory list significantly, it is very easy to part-out the set to your Wanted List. Ensure you are logged into your account. Pull up the catalog entry for the desired set. Click the Part Out link under the My Wanted List section. Clicking the Add to My Wanted List link adds the complete set, not the individual parts, so don't select this option. As an alternative to the steps above, you can click Wanted on the dark green tool bar, then Part Set on the light green tool bar. Both options will take you to the Step 1. Step 1 - The Select Set screen. I recommend creating and naming a New Wanted List, otherwise all the parts will upload to your main wanted list. If you do this for multiple sets, it ends up a confusing mess of parts rather quickly. Next select whether you want to buy New or Used parts, either option is fine. I don't recommend selecting the Any Condition option, as allowing Bricklink to search for new and used parts yields ugly results. You can create both a new and used parts wanted list for a particular set, which is much easier to manage. Finally, I recommend checking the Set My Minimum Quantity box, as this will really simplify purchasing and quick price comparisons between vendors. Some buyers opt not to use this feature, because it excludes a vendor from the search results if they don't all of the quantity of required part. For unusual, hard-to-find, or expensive parts, this is sometimes problematic. I tend to treat those parts as the exception, not the rule, and overall find this option very useful. Step 2 - The Edit Items screen allows you to select new or used part condition for each individual part, set a maximum price you want to pay for each part, change the desired quantity, or delete an individual part from your wanted list. At the bottom of the inventory list, you will see numbered part groups. Depending on the production run, LEGO may have included one of several variations of a particular part. Here you can select which version(s) you want uploaded to your wanted list. Checking the box will delete an alternate part from your wanted list. When you have finished editing the parts (note: you do not need to make any edits) click the Verify Items button. Step 3 - The Verify Items screen is a final review. Scroll to the bottom and click the Upload Items Button. Step 4 - The Items Successfully Uploaded confirmation screen. At first glance, comparing the prices above with current Brickpicker values indicates buying a complete new or used set on the secondary market is probably more cost-effective. This is particularly true if having an original box and instructions are important considerations. That being said, if you're willing to put some additional time and effort into your project, and are agreeable to considering part substitutions, Bricklink may provide the most economical solution. This is where software programs like BrickStock or BrickStore prove invaluable. BrickStock and BrickStore are free, open-source software programs which interface with Bricklink for inventory management. Primarily designed for Bricklink Vendors, these programs are extremely useful for any collector considering a Bricklinking project. These are both great products, and I can't recommend one product over the other, but I have more experience using BrickStock. After you have downloaded and installed one of the above software programs, you're ready to manage the set inventory. The examples below come from BrickStock, but both products share a similar look and operation. The first step is to import the set inventory list into BrickStock. Click on File --> Import --> Bricklink Set Inventory. You can also import set inventories from other popular sources such as Peeron or L-draw or import Bricklink orders or shopping carts. Next you will see the Import Bricklink Inventory search pop-up window. In the search bar, enter #10185 or Green Grocer --> On the left click All Items --> highlight the correct set --> Select OK. Initially the entire set inventory populates and looks like the screenshot below. By default, parts are sorted by color. This is a close up view of the Lower Right Corner of the display. Displayed is the number of Lots - 342 (unique part types), number of total Items - 2342 (parts), Weight - 2.269 kg and Value $0.00 (cost). Initially the Value will display as zero until the parts are Set to the Price Guide. To calculate the total Value/Cost of the set: use the shift key and mouse or CTRL-A to select all the parts (they will highlight in blue) --> click the $= button located in the top toolbar. The Set To Price Guide pop-up window appears. On the left drop down, you can select "All Time Sales", "Past 6 Months", or "Current Inventory". On the right drop down you can select "Minimum", Average" or "Maximum". Selecting Current Inventory gives you the most up-to-date pricing. Selecting Average pricing should give you a similar value to the Bricklink part-out value (without instructions or box). As previously discussed, Bricklink vendors are free to set price parts as they deem appropriate, which accounts for the wide discrepancy between the minimum and maximum values seen above. In my experiences with Bricklinking several sets, I have found the actual cost typically lies somewhere between the minimum and the average values calculated by Brickstock. Realistically speaking, you aren't going to obtain all 2432 parts at the cheapest price offered on Bricklink, but many competitive vendors will offer the common parts close to this price. The key is determining which rare, or hard to find pieces are going to cost the most to obtain in the needed quantity. These are the parts that require the most time and effort to competitively price shop or substitute with a cheaper part option. Green Checkmarks = required pieces included in the inventory. These item will upload to your wanted list. Red X = this is a user selected option, you will not see this unless you manually change the part's status. These items will not upload to your wanted list. Blue + = extra pieces included with the set. Unless deleted or changed to a Red X, these items will upload to your wanted list. Deleting the extra parts (the Blue + symbols) from the wanted list will reduce the overall cost of the project. Scroll to the bottom and find the shaded box number groups. Find the cheapest version in each part group and then delete the others. $565 for all new parts isn't a bad price considering the new in sealed box price is about $950. This price isn't going to include the extra pieces, instructions or a box though. As previously noted, you're not likely to get all the parts at the minimum value, and you're going to end up paying shipping and handling fees to multiple vendors. To really make this project worth the effort, you need to find additional cost savings. Click the Total button to sort the parts list by total cost. Scroll to the bottom of the list to see which parts add the most cost to your Bricklinking project. The 18 part lots highlighted in red comprise $474 of the $564 Part Value. For example, the (50) #3008 Brick 1x8 and (56) #4216 Brick, Modified 1x2 with Groove will cost a minimum of $348 to purchase. Add in the cost of the (54) #3622 Brick 1x3, (41) #3010 Brick 1x4 (35) #3005 Brick 1x1 and (7) #3937 Hinge Brick 1x2 Base, and the cost rises to at least $370. Before tackling the issue of the Sand Green bricks, let's look at some other easy cost-reducing swaps. The (4) #4035 Window 1x2x3 Train cost $28. To modify this part, highlight the #4035 Window 1x2x3 Train, then double click the Description field. The Modify Item pop-up window appears. From here you can select an alternate part. In this case the #60593 Window 1x2x3 Flat Front. This window has a slightly different appearance (see picture below) than the train window, but will fit into the required opening and look great. This set's inventory includes the #60592 Window 1x2x2 Flat Front and #60594 Window 1x4x3 Flat Front, so you're buying a part that is a stylistic match. Select OK to return to the inventory screen. Sometimes changing a part requires adding or deleting another item. In this case you will want to consider adding (4) #60602 Glass for Window, 1x2x3 Flat Front. The original #4035 1x2x3 Train Window didn't require separate glass. Using the same procedure, you can modify the #4864b Panel 1x2x2 - Hollow Studs to the newer #87552 Panel 1x2x2 with Side Supports, Hollow Studs. Once installed, there isn't a visible difference in these parts.The #87552 is widely available for $.02-.03 and drops the price from $10 to $0.6 for this lot. Another option is replacing the #2039 Lamp Post, 2x2x7 with 6 Base Flutes with the #11062 Lamp Post, 2x2x7 with 4 Base Flutes. This drops the price from $4.21 to $0.61 for the part. The (1) #6251px1 Cat Crouching with Black Eyes, Eyelashes, and Nose Pattern is listed at $1.26. Average price in the U.S. is just under $3 however. You could change this to #6251 Cat Crouching which is listed at $0.50. The average U.S. price is a $1.00, so this change may save you $1-$2. The (3) #2431pb043 Tile 1x4 with Viking Snakes Pattern in reddish-brown cost $4.10. You could swap these out for (3) plain #2431 Tile 1x4 in reddish-brown, and drop your cost down to $.09 for the lot. As these tiles add a nice artistic feature to the doorway, I am opting to keep them for my example. At a very reasonable $0.18 cents per brick, the (29) #3008 Brick 1x8 in light bluish-gray aren't a good candidate to switch out. The same goes for the (23) #3010 Brick 1x4 in dark green and the (12) #2429c01 Hinge Plate 1x4 Swivel Top in white. Now we can look at two expensive parts to see the effect of changing to an alternative color. The (4) #2449 Slope, Inverted 75 2 x1x3 in dark red cost $8. Double clicking the Dark Red Color Field, brings up the Modify Color Pop-Up window. For my example, I want to keep the appearance similar to the original version, so I will change the part to plain red. This change drops the price from $8 down to $0.40. Feel free to make any color choice that suits your preference. As previously discussed, searching for part #2449 in Bricklink lets you easily explore all available color options and pricing for each part color. Using the same procedure, you can change the (4) #6005 Brick, Arch 1x3x2 Curved Top in blue to another color. Substituting medium blue in place of blue drops the price from $7.63 to $0.64 for the lot. The original Green Grocer came with (2) 16x32 baseplates. These are available on Bricklink for around $5 apiece, for a total of $10. Alternatively, you could add a new 32x32 green baseplate to your next LEGO Shop at Home order and save $2. For this example, I am keeping the original (2) 16x32 baseplates on my wanted list. The (4) minifigures have a current price of just under $26 on Bricklink. The two missing components are available on Bricklink for an additional $2-$3. This leaves you with three options. For this example, I am going with option #2. Skip the minifigures and save the $26. Buy the individual components from LEGO Bricks & Pieces + Bricklink for $10, and save $16. Buy the whole minifigures from Bricklink for the $26. Click on the third option, BUY BRICKS. The other options are good if you need replacement parts from LEGO due to missing pieces from new sets or manufacturing defect.These are not meant to obtain hard-to-find or expensive parts for other purposes. After entering your age and geographic location you will see this screen. From here you can either search for all parts in a given set, or search all available options for a specific part. Searching for all parts in set #10185 displays the entire inventory, but many parts will show in Gray (Out of Stock). Available parts are shown in black. In most cases, Bricklink prices are more competitive than LEGO Brick & Pieces, but in some situations, I have found LEGO Bricks & Pieces offers the better price. I always recommend a cursory glance at this site before buying an expensive part elsewhere. Click on any parts you want to add to your cart and check out as you normally would at LEGO Shop at Home. S&H charge is typically a few dollars and delivery time often takes 2-3 weeks. Note: Unlike LEGO Pick-a-Brick orders, LEGO Bricks & Pieces orders DO NOT earn VIP points. At this point, with only minor changes made, the minimum cost of the set is down to around $485.This price might be as low as $460 if you made all of the cost-saving choices previously discussed. Considering these prices reflect new parts, this price is about 50-60% of the cost of buying a new in sealed box set. It's entirely reasonable to stop modifying the inventory here and proceed to uploading these items to your wanted list. There are additional savings available however, if you modify the Sand Green bricks. What are the available options? At $3 minimum, and an average price of $4.67 per brick, the (50) #3008 Brick 1x8 in sand green will cost $300-$467 to purchase. This is the 1st target. Highlight the #3010 Brick 1x4 --> Right click on the Quantity Field --> click Set --> change quantity from 41 to 141. Double Click the Green Checkmark next to the #3008 Brick 1x8 and change the status to a Red X, which will remove the item from your wanted list. The total cost has now dropped from $485 to $319. The next part to look at is the (56) #4216 Brick, Modified 1x2 with Groove. At $2.88 minimum and $3.82 average price this part will cost $160-$214 to purchase. The #4216 1x2 Brick, Modified with Groove give the set its architectural detail on the front facade, but not all 56 bricks are required for this purpose. About 1/4 are used in the interior. You could download the instructions and get the exact count of 1x2 grooved bricks you need for the facade (~42) LEGO Green Grocer 10185 Instructions. Instead of the #4216 Brick, Modified 1x2 with Groove, you could substitute the #3004 Brick 1x2 in sand green. At $0.10 per brick, this is a substantial savings. A plain front facade, while serviceable, certainly lacks detail and charm though. As an alternative, you can substitute with the #98283 Brick, Modified with Masonry Profile at a cost of $0.14 per brick. This is a savings of at least $150 for the 56 bricks. Click the Brick+ symbol on the top toolbar --> the Add Item to Inventory pop-up window appears. Double Click the Green Checkmark next to the #4216 Brick, Modified 1x2 with Groove to change the status to a Red X, removing the item from your wanted list. You can use the same procedure to add the previously discussed (4) #60602 Glass, for Window 1x2x3 Flat Front. This should just about finish most of the major changes. Let's take a final look at the results. CTRL-A to select all the parts, then use the previous steps to set them to the price guide at the current minimum price. As shown below, the minimum price has now dropped all the way down to $165!